"Rather than developing production cars into sports cars, we aim to work out how to incorporate the know-how developed through races and rallies into production cars amid various restrictions, and this is how competing contributes to TOYOTA GAZOO Racing's efforts toward making ever-better cars. Thus, this is the starting point for Toyota's completely new challenge to develop sports cars from active race cars. Although it will be some time before you all have the opportunity to get behind the wheel, I hope that the GR Super Sport Concept will give you a taste of what we aim to achieve with our next-generation sports cars. 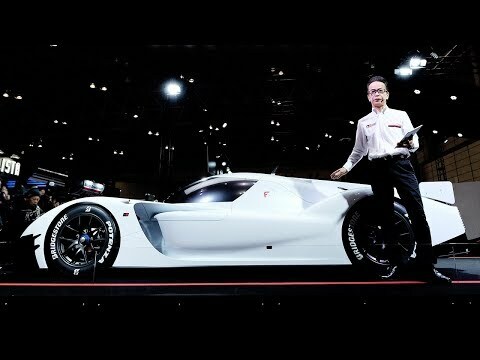 At the end of last year, following the announcement that Toyota would continue competing in the WEC, President Akio Toyoda commented that 'more than 100 years have passed since the birth of the automobile. As the industry approaches times of tremendous change, I am strongly determined to make sure that cars will be fun for the next 100 years.' At CES 2018, held in the United States at the beginning of the year, the e-Palette Concept was revealed as a new shared mobility model for communities. If the e-Palette Concept is the next generation of the horse-drawn carriage, the GR Super Sport Concept would be the polar opposite as the next-generation racehorse. Its appeal is more personal, like that of a much-loved horse to its owner. Despite the differences between the two concept models, both are electrified vehicles equipped with the latest IT technologies and are set to become safe and environmentally friendly connected cars. Although our challenge to make 'cars that will be fun' for the next 100 years has just begun, TOYOTA GAZOO Racing aims to continue making exciting cars to bring smiles to our customers' faces and to contribute to the future of the automobile industry. We look forward to your continued support in achieving this aim."